Hans Joachim Morgenthau (February 17, 1904 – July 19, 1980) was one of the major twentieth-century figures in the study of international politics. Morgenthau's works belong to the tradition of Realism in international-relations theory, and he is usually considered, along with George F. Kennan and Reinhold Niebuhr, one of the three leading American realists of the post-World War II period. Morgenthau made landmark contributions to international relations theory and the study of international law. His Politics Among Nations, first published in 1948, went through five editions during his lifetime. Morgenthau also wrote widely about international politics and U.S. foreign policy for general-circulation publications such as The New Leader, Commentary, Worldview, The New York Review of Books, and The New Republic. He knew and corresponded with many of the leading intellectuals and writers of his era, such as Reinhold Niebuhr, George F. Kennan, and Hannah Arendt. At one point in the early Cold War, Morgenthau was a consultant to the U.S. Department of State when Kennan headed its Policy Planning Staff, and a second time during the Kennedy and Johnson administrations until he was dismissed by Johnson when he began to publicly criticize American policy in Vietnam. For most of his career, however, Morgenthau was esteemed as an academic interpreter of U.S. foreign policy. 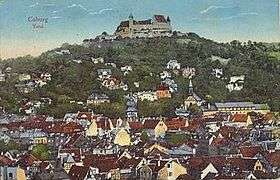 Morgenthau's birthplace: Coburg in 1915. Morgenthau was born in an Ashkenazi Jewish family in Coburg, Saxe-Coburg and Gotha, Germany in 1904, and, after attending Casimirianum, was educated at the universities of Berlin, Frankfurt, Munich, and pursued postdoctoral work at the Graduate Institute of International Studies in Geneva, Switzerland. He taught and practiced law in Frankfurt before emigrating to the United States in 1937, after several interim years in Switzerland and Spain. Morgenthau taught in Kansas City from 1939–1943, during which time he attended the Keneseth Israel Shalom Congregation. Morgenthau then taught at the University of Chicago until 1973, when he moved to New York and took a professorial chair at the City University of New York (CUNY). On moving to New York, Morgenthau separated from his wife, who remained in Chicago partly due to medical issues. He is reported twice to have tried to initiate plans to start a new family while in New York, once with the political philosopher Hannah Arendt as documented by her biographer, and a second time with Ethel Person (d. 2012), a medical professor at Columbia University (she documents this in her essay for the Morgenthau Centenary in 2004). 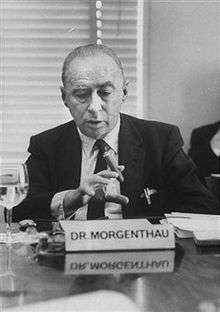 On October 8, 1979, Morgenthau was one of the passengers on board Swissair Flight 316, which crashed while trying to land at Athens-Ellinikon International Airport, while he was en route on a flight destined for Bombay and Peking. Morgenthau died after a brief hospitalization on July 19, 1980, after being admitted with a grave diagnosis of a perforated ulcer at Lenox Hill Hospital in New York, according to the account recorded by Ethel Person. Following completion of his doctoral dissertation, Morgenthau left Germany to complete his Habilitation dissertation (license to teach at universities) in Geneva. It was published (in French) as The Reality of Norms and in Particular the Norms of International Law: Foundations of a Theory of Norms. The legal scholar Hans Kelsen, who had just arrived in Geneva as a professor, was an adviser to Morgenthau's dissertation. Kelsen was among the strongest critics of Carl Schmitt. Kelsen and Morgenthau became lifelong colleagues even after both emigrated from Europe to take their respective academic positions in the United States. In 1933, Morgenthau wrote a second book in French, The Concept of the Political, which was translated into English in 2012. In this book Morgenthau sought to articulate the difference between legal disputes between nations and political disputes between nations or other litigants. The questions driving the inquiry were: (i) Who holds legal power over the objects or concerns being disputed, (ii) In what manner can the holder of this legal power be changed or held accountable; (iii) How can a dispute, the object of which concerns a legal power, be resolved; and (iv) In what manner will the holder of the legal power be protected in the course of exercising that power. The end goal of any legal system in this context for Morgenthau is to "ensure justice and peace." Morgenthau sought in the 1920s and 1930s a realist alternative to mainstream international law, a quest for "functional jurisprudence". He borrowed ideas from Sigmund Freud, Max Weber, Roscoe Pound, and others. In 1940 Morgenthau set out a research program for legal functionalism in the article "Positivism, Functionalism, and International Law". Francis Boyle has written that Morgenthau's post-war writings perhaps contributed to a "break between international political science and international legal studies." However, Politics Among Nations contains a chapter on international law, and Morgenthau remained an active contributor to the subject of the relationship between international politics and international law until the end of his career. Hans Morgenthau is considered one of the "founding fathers" of the realist school in the 20th century. This school of thought holds that nation-states are the main actors in international relations and that the main concern of the field is the study of power. Morgenthau emphasized the importance of "the national interest", and in Politics Among Nations he wrote that "the main signpost that helps political realism to find its way through the landscape of international politics is the concept of interest defined in terms of power." Morgenthau is sometimes referred to as a classical realist or modern realist in order to differentiate his approach from the structural realism or neo-realism associated with Kenneth Waltz. Recent scholarly assessments of Morgenthau show that his intellectual trajectory was more complicated than originally thought. His realism was infused with moral considerations, and during the last part of his life he favored supranational control of nuclear weapons and strongly opposed the U.S. role in the Vietnam War (see below). His book Scientific Man versus Power Politics (1946) argued against an overreliance on science and technology as solutions to political and social problems. Starting with the second edition of Politics Among Nations, Morgenthau included a section in the opening chapter called "Six Principles of Political Realism". Political realism believes that politics, like society in general, is governed by objective laws that have their roots in human nature. The main signpost of political realism is the concept of interest defined in terms of power, which infuses rational order into the subject matter of politics, and thus makes the theoretical understanding of politics possible. Political realism avoids concerns with the motives and ideology of statesmen. Political realism avoids reinterpreting reality to fit the policy. A good foreign policy minimizes risks and maximizes benefits. Realism recognizes that the determining kind of interest varies depending on the political and cultural context in which foreign policy, not to be confused with a theory of international politics, is made. It does not give "interest defined as power" a meaning that is fixed once and for all. Political realism is aware of the moral significance of political action. It is also aware of the tension between the moral command and the requirements of successful political action. Realism maintains that universal moral principles must be filtered through the concrete circumstances of time and place, because they cannot be applied to the actions of states in their abstract universal formulation. Political realism refuses to identify the moral aspirations of a particular nation with the moral laws that govern the universe. The political realist maintains the autonomy of the political sphere; the statesman asks "How does this policy affect the power and interests of the nation?" Political realism is based on a pluralistic conception of human nature. The political realist must show where the nation's interests differ from the moralistic and legalistic viewpoints. Morgenthau was a strong supporter of the Roosevelt and Truman administrations. When the Eisenhower administration gained the White House, Morgenthau turned his efforts towards a large amount of writing for journals and the press in general. By the time of Kennedy's election in 1960, he had become a consultant to the Kennedy administration. When Johnson became President, Morgenthau became much more vocal in his dissent concerning American participation in the Vietnam war, for which he was dismissed as a consultant to the Johnson administration in 1965. This debate with Morgenthau has been related in books about policy advisors McGeorge Bundy and Walt Rostow. Morgenthau's dissent concerning American involvement in Vietnam brought him considerable public and media attention. Aside from his writing of Politics Among Nations, Morgenthau continued with a prolific writing career and published the three volume collection of his writings in 1962. Volume One was entitled The Decline of Democratic Politics, Volume Two was The Impasse of American Politics, and Volume Three was The Restoration of American Politics. In addition to Morgenthau's interest and competence in writing about the political affairs of his own time, Morgenthau also wrote about the philosophy of democratic theory when faced with situations of crisis or tension. Morgenthau's book Truth and Power, published in 1970, collected his essays from the previous turbulent decade dealing with both foreign policy, including Vietnam, and U.S. domestic politics, e.g. the civil rights movement. Morgenthau dedicated the book to Hans Kelsen, "who has taught us through his example how to speak Truth to Power." Morgenthau's last major book, Science: Servant or Master, was dedicated to his colleague Reinhold Niebuhr and published in 1972. After 1965, Morgenthau had become a leading authority and voice in the discussion of just war theory in the modern nuclear era. Just war theory was further developed in the work of Paul Ramsey, Michael Walzer, and other scholars. In summer 1978, Morgenthau wrote his last co-authored essay titled "The Roots of Narcissism," with Ethel Person of Columbia University. This essay was a continuation of Morgenthau's earlier study of this subject in his 1962 essay "Public Affairs: Love and Power," where Morgenthau engaged some of the themes that Niebuhr and the theologian Paul Tillich were addressing. Morgenthau was taken by his encounter with Tillich's book Love, Power and Justice, and he wrote a second essay related to the book's themes. More recently, Anthony Lang has recovered and published Morgenthau's extensive course notes on Aristotle (for a course Morgenthau taught while at the New School for Social Research during his New York years). The comparison of Morgenthau to Aristotle has been further explored by Molloy. Morgenthau was a tireless reviewer of books during the several decades of his career as a scholar in the United States. The number of book reviews he wrote approached nearly a hundred, and included almost three dozen book reviews for The New York Review of Books alone. Morgenthau's last two book reviews were not written for The New York Review of Books and were of the books Soviet Perspectives on International Relations; 1956–1967, by William Zimmerman and Work, Society and Culture by Yves Simon. The last book review Morgenthau wrote for The New York Review of Books appeared in 1971. Morgenthau's first book review, written in 1940, was of Law, the State, and the International Community, by James Brown Scott. Morgenthau also commented on the Pentagon Papers. The reception of Morgenthau's work can be divided into three phases. The first phase occurred during Morgenthau's life up to his death in 1980. The second phase of the discussion of his writings and contributions to the study of international politics and international law was between 1980 and the one hundred year commemoration of his birth that took place in 2004. The third phase of the reception of his writings is between the centenary commemoration and the present, which shows a vibrant discussion of his continuing influence. In his very early career from the 1920s, the book review by Carl Schmitt of Morgenthau's dissertation had a lasting and negative effect on Morgenthau. Schmitt had become a leading juristic voice for the rising National Socialist movement in Germany and Morgenthau came to see their positions as incommensurable. Within five years of this, Morgenthau met Hans Kelsen at Geneva while a student, and Kelsen's treatment of Morgenthau's writings left a lifelong positive impression upon the young Morgenthau. Kelsen in the 1920s had emerged as Schmitt's most thorough critic and had earned a reputation as a leading international critic of the then rising National Socialist movement in Germany, which matched Morgenthau's own negative opinion of Nazism. Morgenthau's Politics Among Nations (1948) had a large influence on a generation of scholars in global politics and international law. From within the realist perspective, Kenneth Waltz urged more attention to purely 'structural' elements of the international system, especially the distribution of capabilities among states. Waltz's neorealism was more self-consciously scientific than Morgenthau's version of realism. Morgenthau's concern with the issues of nuclear weapons and the arms race  led to discussions and debates with Henry Kissinger and others. Morgenthau saw many aspects of the nuclear arms race as a form of irrational madness requiring the attention of responsible diplomats, statesmen and scholars. Morgenthau remained throughout the Cold War an active participant in the discussion of U.S. foreign policy. He wrote in this connection about Kissinger and his role in the Nixon administration. Morgenthau in 1977 also wrote a brief "Foreword" on the theme of terrorism as it began to emerge in the 1970s. Morgenthau, like Hannah Arendt, dedicated time and effort to the support of the state of Israel after its creation following World War II. Both Morgenthau and Arendt made annual trips to Israel to lend their established academic voices to its still young and growing academic community during its inaugural decades as a new nation. Morgenthau's interest in Israel also extended to the Middle East more generally, including the politics of oil. Morgenthau's interest in Israel extended further to related issues of geopolitics, and issues related to Sakharov and Solzhenitsyn. Christoph Frei's intellectual biography of Morgenthau, published in English translation in 2001 (from the earlier German edition) was one of the first of many substantial publications about Morgenthau in the 2000s. Christoph Rohde published a biography of Morgenthau in 2004, still available only in German. Also around 2004, commemorative volumes were published on the occasion of the centenary of Morgenthau's birth. 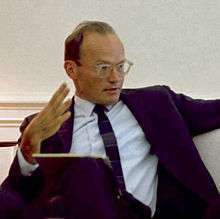 John Mearsheimer of the University of Chicago has studied the relationship of Morgenthau's political realism to the neo-conservativism prevailing during the G.W. Bush Administration in the context of the 2003 Iraq war. For Morgenthau, the ethical and moral component of international politics was on the whole, and unlike the positions of either defensive neorealism or offensive neorealism, an integral part of the reasoning process of the international statesman and the essential content of responsible scholarship in international relations. Various aspects of Morgenthau's thought continue to be explored by scholars (see Further Reading section, below). Scientific Man versus Power Politics (1946) Chicago, IL: University of Chicago Press. Politics Among Nations: The Struggle for Power and Peace (1948, and subsequent editions) New York NY: Alfred A. Knopf. In Defense of the National Interest (1951) New York, NY: Alfred A. Knopf. The Purpose of American Politics (1960) New York, NY: Alfred A. Knopf. Crossroad Papers: A Look Into the American Future (ed.) (1965) New York, NY: Norton. Truth and Power: Essays of a Decade, 1960–70 (1970) New York, NY: Praeger. Essays on Lincoln's Faith and Politics. (1983) Lanham, MD: Univ. Press of America for the Miller Center of Public Affairs at the Univ. of Virginia. Co-published with a separate text by David Hein. The Concept of the Political (2012; orig. 1933) Intro. by H. Behr and F. Roesch. Trans. by M. Vidal. Palgrave Macmillan. For a complete list of Morgenthau's writings, see "The Hans J. Morgenthau Page". ↑ Rice, Daniel. Reinhold Niebuhr and His Circle of Influence, University of Cambridge Press, 2013, complete chapter on Hans Morgenthau. ↑ Rice, Daniel. Reinhold Niebuhr and His Circle of Influence, University of Cambridge Press, 2013, complete chapter on George Kennan. ↑ Klusmeyer, Douglas. "Beyond Tragedy: Hannah Arendt and Hans Morgenthau on Responsibility, Evil and Political Ethics." International Studies Review 11, no.2 (2009): 332–351. 1 2 Zambernardi, L. (2011). "The Impotence of Power: Morgenthau's Critique of American Intervention in Vietnam". Review of International Studies. 37 (3): 1335–1356. doi:10.1017/S0260210510001531. ↑ Morgenthau, Hans (1982). In Defense of the National Interest: A Critical Examination of American Foreign Policy, with a new introduction by Kenneth W. Thompson (Washington, D.C.: University Press of America, 1982). ↑ Hartmut Behr and Felix Roesch, intro. to Morgenthau's The Concept of the Political, trans. M. Vidal, Palgrave Macmillan, 2012, p.13. ↑ Young-Bruehl, Elizabeth. Hannah Arendt: For Love of the World, Second Edition, Yale University Press, 2004. ↑ Mazur, G.O., ed. One Hundred Year Commemoration to the Life of Hans Morgenthau. New York: Semenenko, 2004. ↑ Morgenthau, Hans. Die internationale Rechtspflege, ihr Wesen und ihre Grenzen, in the Frankfurter Abhandlungen zum Kriegsverhütungsrecht book series (Leipzig: Universitätsverlag Noske, 1929), still untranslated into English. ↑ "Fragment of an Intellectual Autobiography: 1904–1932," in Kenneth W. Thompson and Robert J. Myers, eds., Truth and Tragedy: A Tribute to Hans J. Morgenthau (New Brunswick: Transaction Books, 1984). ↑ Behr and Roesch, Intro. to Hans Morgenthau, The Concept of the Political, trans M. Vidal, p. 19. ↑ Morgenthau, Hans. La Réalité des normes en particulier des normes du droit international: Fondements d'une théorie des normes, (Paris: Alcan, 1934), still untranslated into English. ↑ Morgenthau, Hans (2012). The Concept of the Political, Palgrave Macmillan, translated from the French (La notion du "politique", 1933). ↑ Schuett, Robert. "Freudian Roots of Political Realism: The Importance of Sigmund Freud to Hans J. Morgenthau's Theory of International Power Politics." History of the Human Sciences 20, no. 4 (2007): 53–78. ↑ Morgenthau, Hans (1974). "International Law and International Politics: An Easy Partnership," Proceedings of the Annual Meetings of the American Society of International Law (1974), pp. 331–334. ↑ Cf. Jack Donnelly, Realism and International Relations (Cambridge Univ. Press, 2000), pp. 11–12, though he prefers the label "biological realist" to "classical realist". For an argument that the differences between classical and structural realists have been exaggerated, see Parent, Joseph M.; Baron, Joshua M. (2011). "Elder Abuse: How the Moderns Mistreat Classical Realism". International Studies Review. 13 (2): 192–213. doi:10.1111/j.1468-2486.2011.01021.x. ↑ William E. Scheuerman, Hans Morgenthau: Realism and Beyond (Polity Press, 2009); Michael C. Williams, ed., Reconsidering Realism: The Legacy of Hans J. Morgenthau (Oxford Univ. Press, 2007); Christoph Frei, Hans J. Morgenthau: An Intellectual Biography (LSU Press, 2001). ↑ E.g. : Hans J. Morgenthau, "We Are Deluding Ourselves in Viet-Nam", New York Times Magazine, April 18, 1965, reprinted in The Viet-Nam Reader, ed. M. Raskin and B. Fall (Vintage Books, 1967), pp. 37–45. ↑ Hans J. Morgenthau, Politics Among Nations: The Struggle for Power and Peace, Fifth Edition, New York: Alfred A. Knopf, 1978, pp. 4–15. ↑ Russell, Greg. Hans J. Morgenthau and the Ethics of American Statecraft. Baton Rouge: Louisiana State University Press, 1990. ↑ Morgenthau, Hans (1974). "Macht und Ohnmacht des Menschen in technischen Zeitalter," in Oskar Schatz, Hrsg., Was wird aus dem Menschen? Analysen und Warnungen bedeutender Denker (Graz: Verlag Styria, 1974) [in HJMP, Container No. 175]. ↑ Cozette, Murielle. "Reclaiming the Critical Dimension of Realism: Hans J. Morgenthau on the Ethics of Scholarship." Review of International Studies 34 (2008): 5–27. ↑ Murray, A. J. H. "The Moral Politics of Hans Morgenthau." The Review of Politics 58, no. 1 (1996): 81–107. ↑ Scheuerman, William E. "Realism and the Left: The Case of Hans J. Morgenthau." 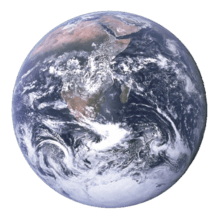 Review of International Studies 34 (2008): 29–51. ↑ Morgenthau, Hans (1973). "The Lessons of Vietnam," in John H. Gilbert, ed., The New Era in American Foreign Policy (New York: St Martin's Press, 1973); Morgenthau, Hans (1975). "The Intellectual, Political, and Moral Roots of U. S. Failure in Vietnam," in William D. Coplin and Charles W. Kegley, Jr., eds., Analyzing International Relations: A Multimethod Introduction (New York: Praeger, 1975); Morgenthau, Hans (1975). "The Real Issue for the U.S. in Cambodia," The New Leader, vol. 58, issue 6 (March 17, 1975), pp. 4–6. ↑ Goldstein, Gordon. Lessons in Disaster: McGeorge Bundy and the Path to War in Vietnam, 2009; Bird, Kai. The Color of Truth: McGeorge Bundy and William Bundy: Brothers in Arms, Simon and Schuster, 2000. ↑ Milne, David. America's Rasputin: Walt Rostow and the Vietnam War, 2009. ↑ Morgenthau, Hans (1962). The Decline of the Democratic Politics: Politics in the Twentieth Century, Volume 1 (Chicago: University of Chicago Press, 1962). ↑ Morgenthau, Hans (1962). The Impasse of American Foreign Policy: Politics in the Twentieth Century, Volume 2 (Chicago: University of Chicago Press, 1962). ↑ Morgenthau, Hans (1962). The Restoration of American Politics: Politics in the Twentieth Century, Volume 3 (Chicago: University of Chicago Press, 1962). ↑ Morgenthau, Hans. "Democracy and Totalitarianism," (n. d.) MS in HJMP, Container No. 110. ↑ Morgenthau, Hans (1974). "Power and Powerlessness: Decline of Democratic Government," The New Republic, vol. 171, issue 19 (November 9, 1974), pp. 13–18. ↑ Morgenthau, Hans (1972). Science: Servant or Master? (New York: New American Library, 1972). ↑ Morgenthau, Hans (1978). "Vietnam and Cambodia," (Exchange with Noam Chomsky and Michael Walzer) Dissent, vol. 25 (Fall 1978), pp. 386–391. ↑ Hans Morgenthau and Ethel Person (1978). "The Roots of Narcissism," The Partisan Review, pp 337–347, Summer 1978. ↑ Morgenthau, Hans (1962). "Public Affairs: Love and Power," Commentary 33:3 (March 1962): 248. ↑ Morgenthau, Hans (1974). "Justice and Power," Social Research, vol. 41, no. 1 (Spring 1974), pp. 163–175. ↑ Lang, Anthony F., Jr., ed. Political Theory and International Affairs: Hans J. Morgenthau on Aristotle's The Politics. Westport, CT: Praeger, 2004. ↑ Molloy, Sean. "Aristotle, Epicurus, Morgenthau and the Political Ethics of the Lesser Evil." Journal of International Political Theory 5 (2009): 94–112. ↑ Morgenthau, Hans (1974). "Review of Book: Work, Society and Culture by Yves Simon," The Annals of the American Academy of Political and Social Science, vol. 411 (January 1974), p. 229. ↑ Morgenthau, Hans (1940). "Review of Book: Law, the State, and the International Community, by James Brown Scott," Political Science Quarterly, vol. 55, no. 2 (June 1940), pp. 261–262. ↑ Moregenthau, Hans (1972). "The National Interest and the Pentagon Papers," (Exchange with Noam Chomsky) Partisan Review, vol. 39, no. 3 (Summer 1972), pp. 336–375. ↑ Behr, Hartmut, and Amelia Heath. "Misreading in IR Theory and Ideology Critique: Morgenthau, Waltz and Neo-Realism." Review of International Studies 35 (2009): 327–49. ↑ Morgenthau, Hans (1975). "Some Political Aspects of Disarmament," in David Carlton and Carlo Schaerf, eds., The Dynamics of the Arms Race (London: Croom Helm, 1975). ↑ Morgenthau, Hans. "Henry Kissinger, Secretary of State," Encounter, vol. 43, no. 6 (November 1974), pp. 57–61. ↑ Morgenthau, Hans (1972). "Superpower Politics," The New Leader, vol. 55, issue 13 (June 26, 1972), pp. 11–12; Joel Rosenthal, Righteous Realists (1991). ↑ Morgenthau, Hans (1973). "The Aborted Nixon Revolution: Watergate and the Future of American Politics," The New Republic, vol. 169, issue 6 (August 11, 1973), pp. 17–19; Morgenthau, Hans (1973). "The Danger of Détente," The New Leader, vol. 56, issue 19 (October 1, 1973), pp. 5–7. ↑ Morgenthau, Hans (1977). "Foreword," in Yonah Alexander and Seymour Maxwell Finger, eds., Terrorism: Interdisciplinary Perspectives (New York: McGraw-Hill, 1977). ↑ Morgenthau, Hans (1973). "The Geopolitics of Israel's Survival," The New Leader, vol. 56, issue 25 (December 24, 1973), pp. 4–6. ↑ Morgenthau, Hans (1975). "Address Delivered by Professor Hans Morgenthau at the Inauguration Ceremony of the Reuben Hecht Chair of Zionist Studies at the University of Haifa," (May 13, 1975) MS in HJMP, Container No. 175. ↑ Morgenthau, Hans (1978). "Facing Mideast Realities," The New Leader, vol. 61, issue 9 (April 24, 1978), pp. 4–6. ↑ Morgenthau, Hans (1974). "Daniel Berrigan and Hans Morgenthau Discuss the Moral Dilemma in the Middle East," Progressive, vol. 28 (March 1974), pp. 31–34. ↑ Morgenthau, Hans (1974). "Israel's Future," Conversation with Daniel J. Berrigan, aired as a Segment of WHET/13's "The 51st State" (January 1974) MS in HJMP, Container No. 175. ↑ Morgenthau, Hans (1975). "World Politics and the Politics of Oil," in Gary Eppen, ed., Energy: The Policy Issues (Chicago: University of Chicago Press, 1975). ↑ Morgenthau, Hans. "On Solzhenitsyn, Sakharov," (Exchange with Harrison Salisbury) War/Peace Report, vol. 13 (October 1974), pp. 7–13. ↑ Frei, Christoph. Hans J. Morgenthau: An Intellectual Biography. Baton Rouge: Louisiana State University Press, 2001. ↑ Hans J. Morgenthau und der weltpolitische Realismus: Die Grundlegung einer realistischen Theorie. P. Weidmann und Christoph Rohde von VS Verlag für Sozialwissenschaften (2004). ↑ Hacke, Christian, Gottfried-Karl Kindermann, and Kai M. Schellhorn, eds. The Heritage, Challenge, and Future of Realism: In Memoriam Hans J. Morgenthau (1904–1980). Göttingen, Germany: V&R unipress, 2005; Mazur, G.O., ed. One Hundred Year Commemoration to the Life of Hans Morgenthau. New York: Semenenko Foundation, 2004. ↑ Mearsheimer, John J. "Hans Morgenthau and the Iraq War: Realism Versus Neo-Conservatism." openDemocracy.net (2005). ↑ Zambernardi, Lorenzo. I limiti della potenza. Etica e politica nella teoria internazionale di Hans J. Morgenthau. Bologna: Il Mulino, 2010. Bain, William. "Deconfusing Morgenthau: Moral Inquiry and Classical Realism Reconsidered." Review of International Studies 26, no. 3 (2000): 445–64. Behr, Hartmut, and Amelia Heath. "Misreading in IR Theory and Ideology Critique: Morgenthau, Waltz and Neo-Realism." Review of International Studies 35 (2009): 327–49. Bird, Kai. The Color of Truth: McGeorge Bundy and William Bundy: Brothers in Arms, Simon and Schuster, 2000. Conces, Rory J. "Rethinking Realism (or Whatever) and the War on Terrorism in a Place Like the Balkans." Theoria 56 (2009): 81–124. Cozette, Murielle. "Reclaiming the Critical Dimension of Realism: Hans J. Morgenthau on the Ethics of Scholarship." Review of International Studies 34 (2008): 5–27. Craig, Campbell. Glimmer of a New Leviathan: Total War in the Realism of Niebuhr, Morgenthau, and Waltz. New York: Columbia University Press, 2003. Donnelly, Jack. Realism and International Relations. Cambridge: Cambridge University Press, 2000. Frei, Christoph. Hans J. Morgenthau: An Intellectual Biography. Baton Rouge: Louisiana State University Press, 2001. Gellman, Peter. "Hans J. Morgenthau and the Legacy of Political Realism." Review of International Studies 14 (1988): 247–66. Goldstein, Gordon. Lessons in Disaster: McGeorge Bundy and the Path to War in Vietnam, 2009. Griffiths, Martin. Realism, Idealism and International Politics. London: Routledge, 1992. Guilhot, Nicolas. "The Realist Gambit: Postwar American Political Science and the Birth of IR Theory." International Political Sociology 4, no. 2 (2008):281–304. Hacke, Christian, Gottfried-Karl Kindermann, and Kai M. Schellhorn, eds. The Heritage, Challenge, and Future of Realism: In Memoriam Hans J. Morgenthau (1904–1980). Göttingen, Germany: V&R unipress, 2005. Hoffmann, Stanley. "Hans Morgenthau: The Limits and Influence of 'Realism'." In Janus and Minerva. Boulder, CO.: Westview, 1987, pp. 70–81. Jütersonke, Oliver. "Hans J. Morgenthau on the Limits of Justiciability in International Law." Journal of the History of International Law 8, no. 2 (2006): 181–211. Klusmeyer, Douglas. "Beyond Tragedy: Hannah Arendt and Hans Morgenthau on Responsibility, Evil and Political Ethics." International Studies Review 11, no.2 (2009): 332–351. Koskenniemi, Martti. The Gentle Civilizer of Nations: The Rise and Fall of International Law 1870–1960 (Hersch Lauterpacht Memorial Lectures). Lang, Anthony F., Jr., ed. Political Theory and International Affairs: Hans J. Morgenthau on Aristotle's The Politics. Westport, CT: Praeger, 2004. Lebow, Richard Ned. The Tragic Vision of Politics. Cambridge: Cambridge University Press, 2003. Little, Richard. The Balance of Power in International Relations: Metaphors, Myths and Models. Cambridge: Cambridge University Press, 2007. Mazur, G.O., ed. One Hundred Year Commemoration to the Life of Hans Morgenthau. New York: Semenenko, 2004. Mazur, G.O., ed. Twenty-Five Year Memorial Commemoration to the Life of Hans Morgenthau. New York: Semenenko Foundation, Andreeff Hall, 12, rue de Montrosier, 92200 Neuilly, Paris, France, 2006. Mearsheimer, John J. "Hans Morgenthau and the Iraq War: Realism Versus Neo-Conservatism." openDemocracy.net (2005). Milne, David. America's Rasputin: Walt Rostow and the Vietnam War, 2009. Mollov, M. Benjamin. Power and Transcendence: Hans J. Morgenthau and the Jewish Experience. Lanham, MD: Rowman and Littlefield, 2002. Molloy, Sean. "Aristotle, Epicurus, Morgenthau and the Political Ethics of the Lesser Evil." Journal of International Political Theory 5 (2009): 94–112. Murray, A. J. H. "The Moral Politics of Hans Morgenthau." The Review of Politics 58, no. 1 (1996): 81–107. Myers, Robert J. "Hans J. Morgenthau: On Speaking Truth to Power." Society 29, no. 2 (1992): 65–71. Neacsu, Mihaela. Hans J. Morgenthau's Theory of International Relations: Disenchantment and Re-Enchantment. Basingstoke: Palgrave Macmillan, 2009. Peterson, Ulrik. "Breathing Nietzsche's Air: New Reflections on Morgenthau's Concept of Power and Human Nature." Alternatives 24, no. 1 (1999): 83–113. Pin-Fat, V. "The Metaphysics of the National Interest and the 'Mysticism' of the Nation-State: Reading Hans J. Morgenthau." Review of International Studies 31, no. 2 (2005): 217–36. Rice, Daniel. Reinhold Niebuhr and His Circle of Influence. University of Cambridge Press, 2013. Rosenthal, Joel H. Righteous Realists: Political Realism, Responsible Power, and American Culture in the Nuclear Age. Baton Rouge: Louisiana State University Press, 1991. Russell, Greg. Hans J. Morgenthau and the Ethics of American Statecraft. Baton Rouge: Louisiana State University Press, 1990. Scheuerman, William E. Hans Morgenthau: Realism and Beyond. Cambridge: Polity, 2009. Scheuerman, William E. "Realism and the Left: The Case of Hans J. Morgenthau." Review of International Studies 34 (2008): 29–51. Schuett, Robert. "Freudian Roots of Political Realism: The Importance of Sigmund Freud to Hans J. Morgenthau's Theory of International Power Politics." History of the Human Sciences 20, no. 4 (2007): 53–78. Schuett, Robert. Political Realism, Freud, and Human Nature in International Relations: The Resurrection of the Realist Man. New York: Palgrave Macmillan, 2010. Shilliam, Robbie. "Morgenthau in Context: German Backwardness, German Intellectuals and the Rise and Fall of a Liberal Project." European Journal of International Relations 13, no. 3 (2007): 299–327. Smith, Michael J. Realist Thought from Weber to Kissinger. Baton Rouge: Louisiana State University Press, 1986. Thompson, Kenneth W., and Robert J. Myers, eds. Truth and Tragedy: A Tribute to Hans J. Morgenthau. augmented ed. New Brunswick, NJ: Transaction, 1984. Tickner, J. Ann. "Hans Morgenthau's Principles of Political Realism: A Feminist Reformulation." Millennium: Journal of International Studies 17, no.3 (1988): 429–40. Tjalve, Vibeke Schou. Realist Strategies of Republican Peace: Niebuhr, Morgenthau, and the Politics of Patriotic Dissent. New York: Palgrave, 2008. Tsou, Tang. America's Failure in China, 1941–50. Turner, Stephen, and G.O. Mazur. "Morgenthau as a Weberian Methodologist." European Journal of International Relations 15, no. 3 (2009): 477–504. Williams, Michael C., ed. Realism Reconsidered: The Legacy of Hans Morgenthau in International Relations. Oxford: Oxford University Press, 2007. Williams, Michael C. "Why Ideas Matter in International Relations: Hans Morgenthau, Classical Realism, and the Moral Construction of Power Politics." International Organization 58 (2004): 633–65. Wong, Benjamin. "Hans Morgenthau's Anti-Machiavellian Machiavellianism." Millennium: Journal of International Studies 29, no. 2 (2000): 389–409. Young-Bruehl, Elizabeth. Hannah Arendt: For Love of the World, Second Edition, Yale University Press, 2004. Zambernardi, Lorenzo. I limiti della potenza. Etica e politica nella teoria internazionale di Hans J. Morgenthau. Bologna: Il Mulino, 2010. Guide to the Hans Morgenthau Collection at the Leo Baeck Institute, New York.